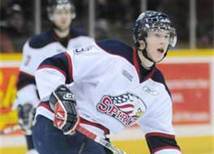 Justin Kea posted an assist Thursday as Saginaw skated to a 7-5 preseason win over Sarnia. The 6'4 center earned a secondary helper on the power play to give the Spirit a 2-0 first period lead. The victory gives Saginaw a 2-0 record in exhibition play. Kea, who scored three goals and 14 points in 65 games last season, should be in line for a statistical jump in 2012-13 while maintaining a physical two-way presence for Greg Gilbert's Saginaw squad. The Spirit continue the preseason Saturday when they welcome Sault Ste. Marie to the Dow Event Center.